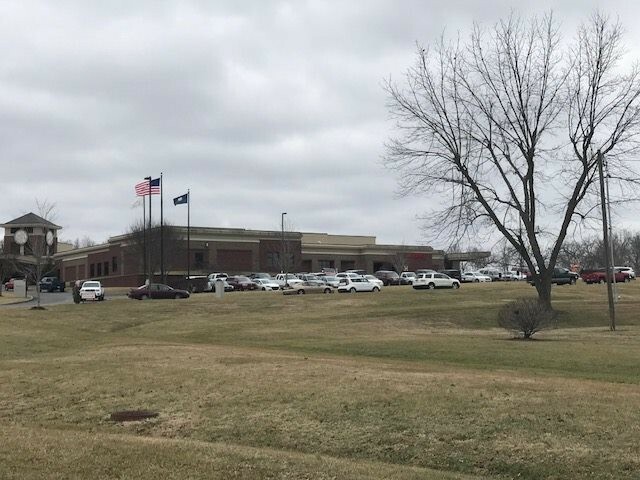 BENTON, Ky. (KT) – Two teens were killed and 17 others injured when a 15-year-old boy went on a shooting rampage in a western Kentucky high school on Tuesday, authorities said. The shooter, who attends the high school, was arrested by a Marshall County sheriff’s deputy and is in custody. Witnesses saw him being led away in handcuffs from Marshall County High School. Kentucky State Police Lt. Michael Webb said he would be charged with murder and attempted murder. In a news conference Tuesday evening, KSP reported Bailey Nicole Holt and Preston Ryan Cope, both 15, were the two students who died. Holt was killed at the scene of the shooting and Cope was pronounced dead at Vanderbilt University Medical Center in Nashville, Tenn. The shooter’s identity or motive were not released by authorities at the press conference. They do believe the shooting was the work of only the one shooter. The two deaths was first released by Gov. Matt Bevin at a press conference Tuesday afternoon at the Marshall County school board offices. Bevin rushed to the scene from the Capitol after learning of the horrific news. Twelve victims were treated for gunshot wounds and five others were injured during the incident, Bevin said. The shooting was reported about 8 a.m. CST. Six of the wounded students were taken to Vanderbilt University Medical Center, which is about 100 miles from the scene, according to an Associated Press report. “This is a wound that is going to take a long time to heal, and, for some, will never heal,” Bevin told reporters. Local businessman Mitchell Garland said students fled in terror from the school, some speeding away in cars, others on foot. Emergency responders were on the scene within 7 minutes of the first 911 call, said Kentucky State Police Commissioner Richard Sanders. Ambulances and police cars converged on the school and officers wearing black fatigues carrying assault rifles were on the scene. Tuesday’s shooting happened as students gathered in a common area just before classes began. Sixteen-year-old Lexie Waymon told the AP said she and a friend were talking about the next basketball game, makeup and eyelashes when they heard the first gunshots. A Marshall County deputy apprehended the alleged shooter, according to state police, about 10:26 a.m., roughly 15 minutes after saying the scene was secure. Webb said the Marshall County sheriff’s deputy disrupted the shooting. “There is no way to know how much further it would have went,” he said about the sheriff’s deputy’s heroic actions. Sanders said the school had recently gone through active shooter training. “The students at the school did exactly as they were trained,” he said. Schools, churches and community groups in the Marshall County area were already planning vigils to honor the victims. “It is unbelievable that this would happen in a small, close-knit community like Marshall County,” Bevin said. 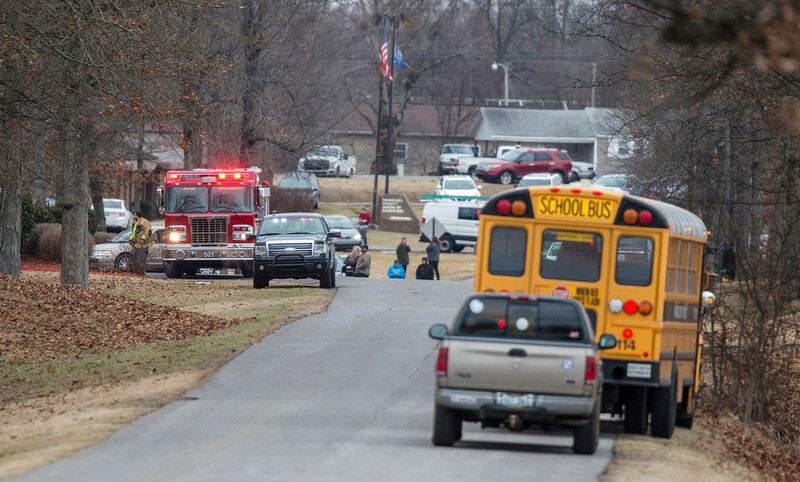 Marshall County is about 30 miles southeast of Heath High School in West Paducah, a 14-year-old opened fire in 1997, killing three and injuring five others. Tuesday’s rampage happened just days after the 25th anniversary of a shooting at East Carter High School in eastern Kentucky, where a student shot a teacher and custodian and held his classmates hostage. Last November, when students at Marshall County High School went through an active shooter training, nobody imagined they would have to put it in practice two months later. But when the unthinkable happened on Tuesday morning, the training for students and staffs was put into play. Two students were killed and 17 wounded, but the preparation may have kept the incident from being worse. Many students ran for cover after hearing the gunshots, some as much as a mile down the highway to a local McDonald’s, and others sought cover. Sanders said there was also a resource officer at Marshall County when the shooting happened. A Marshall County sheriff’s deputy was able to disrupt the shooter, preventing more carnage, officials said, about 10:26 a.m., roughly 15 minutes after saying the scene was secure. “I know that, as parents, our greatest fear is something happening to our children, and today that fear became a reality,” Marshall County Schools Superintendent Trent Lovett said in a statement on Twitter. This was not Kentucky’s first school shooting. Twenty years ago, there was a school shooting where two were killed and seven others injured at Heath High School, about 35 miles from Marshall County. Heath High School was the worst high school shooting in Kentucky’s history, until Tuesday. Twenty-five years ago last week, two were killed at a school shooting at East Carter High School in Grayson. Here are four school shootings in the past 25 years. Jan. 18, 1993: East Carter High School in Grayson. Scott Pennington, a 17-year-old student, fatally shot his 48-year-old English teacher, Deanna McDavid, and 52-year-old head custodian, Marvin Hicks. Pennington was sentenced to 25 years in prison. Dec. 1, 1997: Heath High School in West Paducah. Three students were killed and five wounded by 14-year-old Michael Carneal, as they participated in a prayer circle. Carneal was sentenced to life in prison. Jan. 5, 2013: Hazard Community and Technical College in Hazard. Dalton Stidham, 21, used a semi-automatic pistol he bought earlier in the day to shoot and kill his former girlfriend Caitlin Cornett, 20, her uncle Jackie Cornett, 53, and her 12-year-old cousin in the school parking lot. He later turned himself into police. Sept. 30, 2014: Fern Creek Traditional High School in Louisville. One student was injured in the shooting. The incident occurred around 1 p.m., reportedly after student became enraged in a hallway and pulled out a gun. The student was arrested later that day. I don’t live in Southeastern Ky. I did work for several towboat companies in Paducah. First I want to say I am thankful no family members of those people to my knowledge were involved, In 2012 a young man named Adam Lanza shot and killed multiple people he had a brother who had nothing to do with that shooting and he became one of the most hated people, accused and judged in the court of public opinion. Imagine being part of the family of that 15 year old shooter, you are guilty in that same court! Remember this if you did not hear it, see it, taste it or feel it at the scene you don’t know. If you have a friend, a trusted associate who told you, you were not there. Everyone feels, sees, tastes and hears things differently. Don’t join that court, you night be considered by that same court to be a BULLY and you are!